The other night I learned that I would be able to attend an evening event at a museum near home this Friday. I had begun drafting a pattern for a c.1795-1820 Pelisse from Janet Arnold's 'Patterns of Fashion' Vol. 2 over a year ago, so I pulled that out, finished it up, and now I'm in the process of cutting out several silk Pelisse jackets to sew. One to wear, and one to sell. One is a beautiful coral colored taffeta with windowpane plaid design, another is a white silk with delicate pearl beadwork. It's so rewarding to be able to use a pattern based directly from an original. 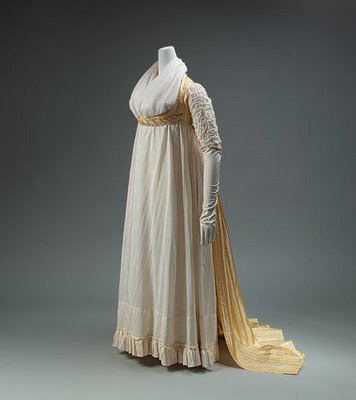 The design lines of historical clothing are always so beautiful. I love this robe! I always thought that this style was an over robe, and Pelisses were more jackets were attached skirts? Am I wrong? Very pretty. I have the same question as Aloha? I'm excited to see what you come up with. I'm not sure which is the most appropriate term for this style of garment. Janet Arnold calls it an Open Robe. I've gotten used to calling it a Pelisse after originally intending to make it for warmer weather outerwear as seen in the movie Sense and Sensibility. I do remember it being called an Open Robe when we learned about it in Costume History class in college, so that term is probably more appropriate. I finished the two Open Robes. One coral colored, the other the pearl beaded white silk. I just didn't get a chance to photograph them yet! I'm excited to make more, they went together rather quickly after the pattern was completed!